Cropped corsets: trashy or trendy? You be the judge. Some might say, "Oh, how cute and high-fashion! ", while others (i.e. your dad) might say, "Where is the rest of it? Get back in the house!!" Personally, I think cropped corsets are adorable on the right person, in the right context, when styled the right way. Problem: When it comes to wearing a cropped corset, there are 100 trashy ways to wear it for every 10 trendy ways. Here are a few tips if you are thinking about rocking a cropped corset this summer. 1. Consider choosing more "modest" bottoms. Either a high-waisted, mid-length or maxi-skirt or a pair of high-waisted, wide-legged jeans are good options. You don't even have to show ANY midriff! Pairing a cropped corset with little short shorts quickly create a "swimsuit" look. 2. Speaking of which, a bikini or tankini top does NOT double as a shirt. Unless you're walking from the beach to your car, don't even think about it. 3. Don't TRY for the "pin up" look. When you actually TRY for the "pin up" look in addition to wearing a cropped corset you have probably gone TOO far and trashified a trend. Let the cropped corset speak for itself rather than trying to be a walking commercial for "all things 1950's." This isn't Halloween. 4. Go for straps, but NOT sports bra-like straps. See the difference between the tops on Selena Gomez and Katy Perry below. Katy Perry's lime green top looks like it belongs in a gym. 5. I shouldn't be able to see an entire 6-pack worth of stomach. If there is enough skin showing that I could see every section of your abs, you are wearing a bralet, not a crop top, and this does not qualify as a shirt. You would not even be allowed into a McDonald's, miss. 6. If you are self-conscious about showing skin, throw a cardigan, jacket, or vest over top. I think this looks super chic, and this way, you will only show skin from the front, rather than from every angle. It's also a great way to cover up if you start to feel uncomfortable (i.e. you go into a restaurant, meet a creepy guy, etc). Just button a couple buttons, and you're set! 7. Meeting the parents? Going to church? Live in a conservative, small town in Minnesota? Let's be real. Certain places are not conducive to cropped corsets. If you walked down main street wearing a midriff baring cropped corset in my small town Minnesota, there is a good chance of getting unwanted stares within about 10 minutes. What's the solution? Get a longer cropped corset and wear high-waisted shorts/pants/skirts to avoid showing any skin! 8. Look for a top with a print or texture to it. 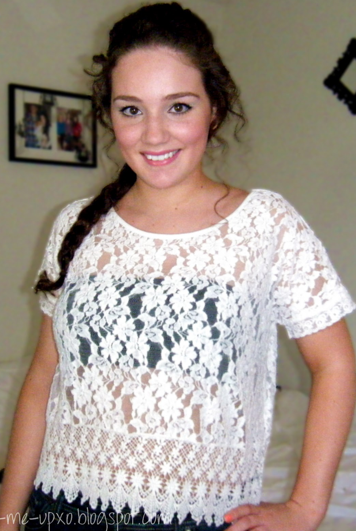 When wearing a top with such little fabric, it helps to add some dimension to avoid looking too casual or cheap. Solids will draw more attention to your skin, while prints or textures will draw more attention to the fashion itself. A print or texture can also advance the trendy-factor of the top by taking advantage of this season's hot florals, tribal prints, or lace. 9. 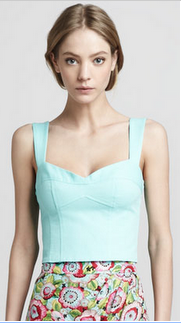 A thin spandex/nylon bandeau does not constitute a shirt (see left). Rather, it's to be worn as an underdressing for a shirt that is transparent or has large armholes (see right)-- it is NEVER okay to wear it alone. 10. Two of my personal favorites include this red one from Hungover Sundays (below left) and this black one by GUESS for Marciano (below right). Also, check out the bustier crop tops from Polyvore, American Apparel, Forever 21, Nordstrom's, Urban Outfitters, and GUESS. Your best bet is to go to the stores directly, as many of the tops are sold out online, and you'll want to try them on for fit/length before buying.